Pressurised tank liquid level differential pressure cell transmitter for process plant storage. This dp cell transmitter is used to determine the quantity of liquid inside a pressurised tank by measuring the difference in pressure between the bottom and top of the tank. Measuring the differential pressure removes the component of gas pressure at the top of the tank leaving the hydrostatic pressure generated by the liquid column. The hydrostatic pressure can then be converted into a liquid height and incorporated into the volume calculation for the storage tank. The DPT200 dp cell transmitter is a robust heavy duty pressure measurement instrument with a high and low pressure connection port to allow two pressure inputs. The DPT200 will measure the pressure difference between the Hi & Lo side and will output the result as a 2 wire 4 to 20 milliamp current loop signal. Pressurised tanks are used to store liquids which would otherwise easily evaporate or return to a gaseous state because of vaporisation and boiling. These storage tanks are located on sites which have adopted process industry standards such as HART communications, mounting flange connections, armoured cable termination, and controlled by regulatory standards such as ATEX intrinsic safety or flameproof certification for flammable risk environments. This dp level transmitter will help reduce spares inventory since the output and local display reading can be re-scaled to suit the variation in tank height and liquid density, on sites which include a number of different sized storage tanks and substance types. The datum (4mA) can be set to any height elevation of the tank, to improve resolution, and accommodate any wet leg offset that maybe utilised to prevent calibration errors caused by accumulating condensation on the low side leg. The span (16mA) can be set to any height above the datum point, and the hydrostatic pressure converted to liquid level and specific gravity compensated. 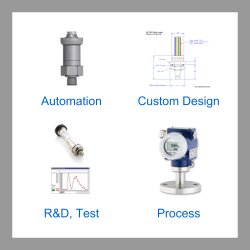 Prevent unnecessary failures from accidental disconnection of process fittings or closing off isolation valves on one side of the dp level transmitter. The DPT200 has as standard built-in overload protection from unexpected high pressures on each port, whether applied to one side or both together. Ensure compatibility with corrosive liquids by selecting the flange, diaphragm and seal material to be used when building the dp level transmitter. Choose from stainless steel 304 or 316L for the flange, stainless steel 316L or Hastelloy C276 for the diaphragm, and FKM, EPDM, NBR or PTFE for the seals. What is the over-pressure limit on the Hi & Lo pressure side? 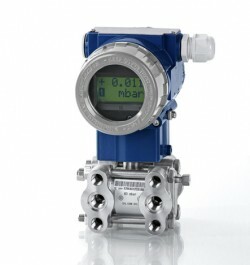 This differential pressure transmitter is designed to withstand the maximum line pressure on one side only, irrespective of whether it is applied to the Hi or Lo pressure side process connections. Should you use a dry or wet leg on the low pressure side to connect to the top of the tank? You can connect either a dry or wet leg to the low pressure side, but there are advantages and disadvantages of using both. A dry leg will provide a direct connection to the pressure at the top of the tank, and the dp level transmitter will not require any significant output adjustment to measure the liquid level. However, condensation of vapour in the dry leg will need to be prevented or regularly drained off, to avoid the build up of a liquid head which will upset the calibration settings of the dp level transmitter. A wet leg provides a way to maintain a fixed height liquid head when vapours emanating from the top of the tank are likely to cause significant condensation in the low pressure side line. 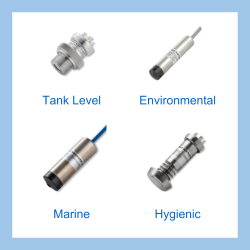 Since the fixed liquid head is acting on the reference side of the dp level transmitter, and is equivalent to the pressure generated by the maximum liquid level in the tank, the output signal will act in the reverse direction. 4mA will correspond to a full tank, and 20mA will correspond to an empty tank. This reverse signal can be rectified by elevating the zero level reading to minus 100% of range, so 4mA now corresponds to an empty tank (zero pressure on the high side, and full range pressure on the low side). As the level in the tank increases, the pressure difference between the high and low side will decrease, eventually falling to zero, which will correspond to a full tank (full pressure on both sides) and a 20mA output. Does it matter what the pressure is at the top of tank, or whether it changes? The 2.5 bar (~25m max high tank) differential range has a maximum line pressure rating of 160 bar, so you can install the DPT 200 on any tank pressurised up to 160 bar. Since the DPT 200 is measuring differential pressure, if the gas pressure at the top of tank increases by 1 bar, it will also increase the pressure at the bottom of the tank, therefore the difference in pressure which corresponds directly to the liquid level, will remain unchanged. Send us your enquiry for DPT200 Pressurised Tank Level Differential Pressure Transmitter to get assistance with this product type.